Next week I’m looking forward to visiting Edinburgh for the 7th International Conference on Open Repositories (OR2012) and delivering my very first Pecha Kucha (Japanese for chit-chat apparently) a presentation format based on 20 slides of 20 seconds. 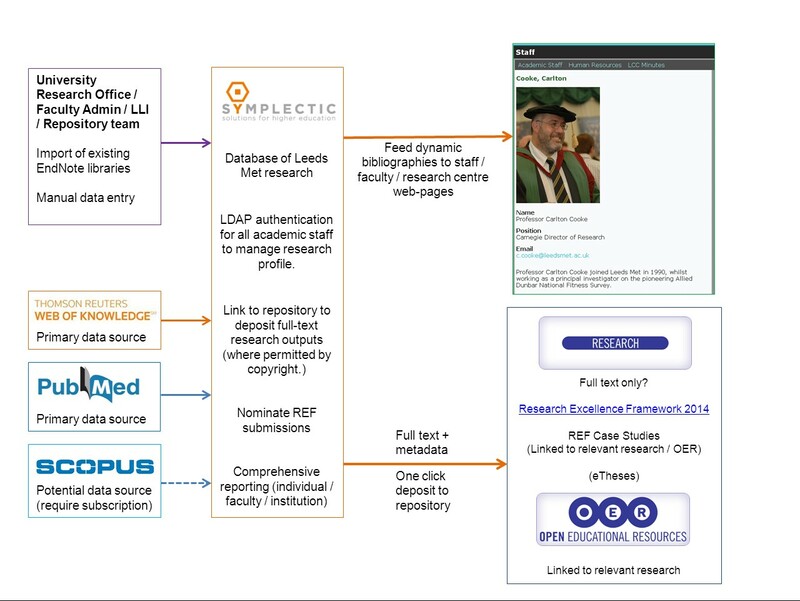 Having implemented an institutional repository at Leeds Metropolitan and learning by experience some of the difficulties associated with advocacy around the use of that repository (both for OA research and OER) I have become all too aware “that repositories are ‘lonely and isolated’; still very much under-used and not sufficiently linked to other university systems”. So said JISC’s Andy McGregor at an event called “Learning How to Play Nicely: Repositories and CRIS” in May 2010 at Leeds Metropolitan (see my report for Ariadne here). This quote is still relevant, though perhaps a little less so than when I heard it nearly 2 years ago, thanks to the ongoing work of JISC and particularly the RSP. In any case, the event was a revelation for me and I have coveted a so called Current Research Information Management systems (or CRIS for short) ever since! In fact, this may well not be all the pieces…pretty sure a few have been pushed down the back of the settee. I’ll look for them later. Anyway, tortured metaphors aside, I have become increasingly aware that working in a large institution, in a role that encompasses technology and institutional policy (though I’m not, by any means, a policy maker…or indeed a real techie) is largely about communication and getting the right people, with the right skills, in the right place at the right time! Absorb policy and technical requirements from senior stakeholders and communicate those requirements to the proper techies – while also trying to ensure any motivating passions of one’s own don’t get lost along the way – Open Access to research and Open Education in my case. For various reasons, individual user accounts have never been implemented for our repository and historically it has been administered centrally from the Library. In Symplectic we now have a system that is populated with central HR data; all staff will have an account they can access with their standard user name and password from where they can manage their own research profile including uploading full-text outputs directly to the repository*. In addition, administration by the University Research Office and faculty research administrators will be more easily centralised (particularly for the REF). * In actual fact this functionality is not yet available in lieu of development work from Intrallect to capture the Atom feed from Symplectic and transform with XSLT to a suitable format for intraLibrary. I think. One of the clever bits of functionality used to sell the software is automatic retrieval of bibliographic data from online citation databases – we are currently running against various APIs, Web of Science (lite), PubMed and arXiv – but I think this may actually be a bit of a red-herring for an institution like Leeds Metropolitan – at least until more (preferably free) data sources are available (JournalToCs API please! ); early testing has shown, at best, it will only retrieve a subset of (the types of) outputs that we will need to record and it will be necessary to manually import existing records (e.g. EndNote) as well as implementing other administrative procedures at faculty level to capture information at the point of publication, especially for book-items, monographs, conference material, reports and grey literature. More important, I think, to ensure that academic staff actually engage with the software rather than just seeing it as a tool for administrators, is to re-use the data to generate a list of research outputs – a dynamic bibliography – on a personal web-profile which has the potential to dramatically increase the visibility of research including Open Access to full-text. N.B. From the Symplectic interface, a user is able to “favourite” a research record and a flag comes out in the xml from the API which I understand is used on this page to display “Selected Publications”. DOI is also available from the API to link to the published version and if a user uploads full-text to the repository from Symplectic, this link is also in the xml – the first two records on this page include links to the full-text in Keele’s intraLibrary repository. Our own Library web-dev Mike Taylor has been looking at the Symplectic API in detail and has put together a couple of prototype pages on a development server and after a meeting this week with a representative of the central web-team I’m reasonably confident we can move forward with this work fairly quickly…though there’s still a bit of a chicken & egg situation in populating the Symplectic database to then be re-surfaced via the API in this way. There is also the question of whether we might alter our repository policy to become full-text only; one limitation of repositories across UK HE from an original conception (in the arXiv mould) of holding, disseminating and preserving full-text research outputs, is that they have in effect become “diluted” by metadata records for which it has not (yet) been possible to procure full-text or copyright does not permit deposit and “hybrid” repositories like ours, of full-text and metadata typically contain more metadata records than full-text (see figures from the RSP survey here). As I have argued on the UKCoRR blog, I think is makes sense to separate a bibliographic database (in Symplectic) from full-text only in a repository. With our “blended” repository comprising research and UKOER, I still feel very much like I have a foot in two camps. A feeling that, ironically, is reinforced, by my role as Technical Officer for UKCoRR – the UK Council of Research Repositories! I think I’m right in saying that it’s still atypical to manage both types of resource with a single repository platform and there are certainly considerations why it may not necessarily be desirable – both from a technical and political perspective. Coates, C., Smith, S. (2010) Promoting the concept of competency maps to enhance the student learning experience. Assessment, Teaching and Learning Journal (Leeds Met), 10 (Winter), pp.21-25. With such an approach, is there perhaps an opportunity to tie research and OER more closely together at an institutional level (if this isn’t politically naive!) and contribute to research led teaching? Workflow, in fact, has long been a bug-bear of mine and, for both types of resource, essentially remains fully mediated by me and administrative colleagues. In all likelihood, however, as are many institutions, we will soon be implementing a CRIS that will make it easier to collate institutional research outputs by harvesting research data from external bibliometric sources, as well as allowing records to be added manually, and integrating with the repository such that academic staff are able to attach an appropriate full-text to a record and upload it along with metadata into the repository directly from a “user-friendly interface” (TM). At a recent demo of one of these types of system I confirmed that it could transfer a range of file-types to a repository (utilising SWORD) as well as allowing various licences to be configured including (I think) Creative Commons so there seems no fundamental reason why such a system could not be used to support the workflow for both OA research and OER. Of course I will need to get my hands on one of these systems before I can properly investigate exactly what is achievable…watch this space. Hylton, K. (2008) 'Race' and Sport: Critical Race Theory. Routledge. As far as I understand, Dr. Hylton is currently at the stage of identifying suitable material for the archive and asked me whether it was possible to cross-search UK Institutional Repositories to discover relevant full-text research material in this area (having, on numerous occasions, had the [mis]fortune to hear my advocacy on Open Access and repositories!). As far as I am aware there are two services currently available – the UK Institutional Repository Search from MIMAS and the custom Google Search at OpenDoar (I’d be interested to know of any others) and some preliminary searches yielded a few relevant results – though there is no way of specifying full-text only, of course, which means many results are bib records only. In the meantime, if anyone does have appropriate full text material archived in their repository please let us know and/or pass the call on to interested colleagues. I wasn’t able to attend the UKCoRR meeting held in Kingston on Friday, as much as I would have liked to. It sounds like I missed out on a really good day with an excellent programme. 1) Concern about the costs: these might escalate, and sometimes amount to “double dipping” (some publishers are paid by authors and subscribers because they charge authors for OA article publication but don’t reduce their subscription fees). 3) An institutional response might be to set up an OA fund, or it might be to encourage authors to deposit post-prints into the OA repository, rather than paying such publishers’ fees. Some researchers object to the fees being charged. 4) The Wellcome Trust does seem to prefer that the authors pay for OA publication, and indeed it suits authors better than depositing themselves because a part of the Wellcome mandate is for PubMed deposit. By paying, authors can leave the PubMed deposit up to the publishers to do. Is the Wellcome Trust’s mandate skewing the OA landscape in the way publishers have responded to them, whilst other academic disciplines are no way near as well funded? On the strength of this I’m certainly looking forward to attending future UKCoRR events – maybe even oop North next time?! I think it fair to say that intraLibrary being the platform behind Jorum was a factor in our institutional decision to use the platform at Leeds Met so as the #ukoer projects get underway including Unicycle of course, it is with considerable interest that I discover that Jorum plan to implement a customised DSpace repository apparently to run alongside intraLibrary. The news came to my attention in an email on the OER-INST mailing list which said that the move was to ensure that Jorum scales up for global access. This I promptly tweeted (me being me) and received a couple of coy allusions from interested parties before a tweet from @JorumTeam informed me that “All OER content for #jorum will be served from DSpace. Content licensed under JEducationUK or JPlus will be served from Intralib.y“. Aside from this tweet, I’m not sure if there’s been anything more official from Jorum yet and apologies if my immediate web 2.0 dissemination of information in a closed mailing list was in any way inappropriate. As discussed in previous posts (eg. This one), I am aware of one or two issues with facilitating Open Access via intraLibrary, though I am confident that we do indeed have suitable technology within the software to facilitate OA, in the form of RSS, SRU and OAI-PMH for example. It may be there are other issues around scalability that I am unaware of and I’d be very interested to learn why and precisely how Jorum have decided to also utilise DSpace.